and--clap your hands--the Peanuts Play School. This morning we awoke to the phone ringing at 5:20 AM, with the news "No school today" (actually, truth be told, the kids had woken us up at least 15 minutes before that--early risers!). It's unfortunate as today is the day that elementary school-aged kids look forward to for weeks--class parties, gift exchanges, and, in my classroom's case, Lumberjack Day. All will be rescheduled, but without the excitement and anticipation of leaving for a two week break from the usual routine. We've started reading A Magician's Nephew for our family's nightly read aloud. I hate to admit that I have never read The Chronicles of Narnia myself. My parents read them aloud to me when I was young, but I don't remember a lot. I look forward to it as much as the kids each night. On the recommendation of some friends, I began reading The River Why? by David James Duncan this summer. Before I got too far into it, Christa stole it to read it for a book club. I checked it out again over Thanksgiving Break, but haven't been able to read more than a page or two. Speaking of blogs... I highly recommend the blog A Year of Reading if you're looking for new books for your classroom (or yourself). I check in on a regular basis using Google Reader (Anyone interested in Tech Tips 102?). Folks from the book club suggested that I teach a class on technology tips for teachers. In lieu of a class, I'm forwarding along a few suggestions to them. Here are some of the items that we discussed at our book club meeting last Friday. You can open several tabs that you would want to open each time you open Firefox. At school I have three tabs open up: IC, Gmail, and Moodle. At home I have five tabs open up: Gmail, Google Reader (more on this later), NY Times, ZPS webmail, Moodle. The options are endless. In Firefox, to open multiple tabs go to File -> New Tab and then open the page(s) that you'd like to have open when you launch Firefox. To set them to open up go to Tools -> Options, choose Main, click Use Current Pages, and then click OK.
Easy as that! If you'd like more information, Firefox has a great explanation of how it works. Click Edit Labels and then create your labels, separated by a comma and then click Save. Your library is always being saved as you work so you don't need to worry about that. Here's the link to my classroom library. "Ultimately, mindful [teaching] is about seeing our [students] clearly and listening to and trusting our own hearts." During the past two weeks there have been at least three nights where crying or sick children have awoken me around 3:00 AM. Usually when this happens I am so tired that I will fall back asleep the second my head hits the pillow. However, during these two weeks when I wake up my mind begins running and I haven't been able to fall back asleep before my alarm goes off at 5:30. The interesting thing is that most of these early mornings as I have laid awake I have not been thinking of things that I need to do. Rather, I have found myself trying to put into words the things that I have been reading, learning, and observing in my students. I feel like I am entering a new, uncharted territory in my own thinking about education. Maybe it is that I am finally finding the practical tools to put my philosophy into practice. Maybe it is just that between my discussions with Rhonda, my book club reading, and feeling comfortable with fourth grade curriculum, I can take my thinking, and my students' thinking, to the next level. Maybe I'm just excited to be a teacher. My dad had this saying hanging in his workshop in the basement of our small home in Minneapolis. It was neatly framed and written in a Gothic script. There was a great contrast between it and the "creative mess" that surrounded it. On two walls of the workshop there were peg boards with lots of hooks and brackets. Everything had its place, but nothing was in its place. As the saying goes, like father, like son. This sign now hangs above my desk in my "workshop." It accurately describes the past, present, and probably future state of my small desk area in the corner of my classroom. I have places for everything - stacking trays, baskets, drawers, a filing cabinet - but nothing is in its place. When I do actually get around to cleaning up (usually when my chair won't wheel around due to the stacks on the floor or when the stacks are so large that they are sliding off my desk), the feeling of being able to see the faux wood grain on my desk is indescribable. Maybe a favorite author of my mom says it best: "Order calms." Yet, the other day as I was talking to my teaching partner, I began to explain that I think "a creative mess" describes more than just the physical environment of my desk area. It also describes the teaching and learning that we have come to call inquiry/constructivist/the workshop approach. It is messy, I don't always know where the day or week will take my students and I. Each weekend I sit down and fill out what I have come to call "The Big Picture." I look at where my students are at, where we need to go, and how we can get there. But once the week begins my plans will change depending upon how quickly my students grasp a concept, what questions arise, and how long investigations and our discussions take. While this form of learning and teaching can be "messy," it is also quite "creative." My students and I learn so much each day. It is fun to see how far they have come in the past three months and how willing they are to try new things. In Teaching with Intention, we're encouraged to take a look at what we believe about the way students learn and then look at our classroom to see if that really happens. 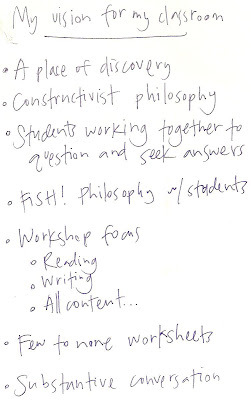 About two and a half years ago, during the summer before I began teaching fourth grade, I made these notes about my personal vision for my classroom. I stapled them to my bulletin board, where they were quickly covered up by other items, and there they have remained until I pulled them off a few weeks ago. I was surprised to see how close to my vision I have come. The past two years, I've been making small steps towards my vision. It has taken time to learn the curriculum, understand the developmental level of my students, and feel a part of the school community. Once those items were figured out, it has become easier to work on the thinking skills that I want to develop. I learned plenty. Most of all, I learned the importance of slowing down and being present, of taking the time to think about and develop ideas, synthesize new learning, and write about what I had learned about my kids or myself as a teacher that day. And what that might mean for the days ahead. So, in my pursuit of teaching according to my own philosophy of education, I'll be making an effort to take 15 minutes at the end of each day to record my thoughts. We'll see how it goes. I launched this blog a week ago and this is my first post. "A journey of a thousand miles begins with a single step," right?